UPDATE: The World Affairs Council is pleased to offer Dallas Busines Club members special pricing of $30. Select Cooperating organization when registering. 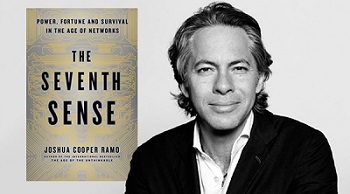 Joshua Cooper Ramo may have one of the world’s most interesting minds – and the ability to express his thoughts clearly in an era burdened with the challenges of unexpected events. He built a career in journalism, consulting, monitoring China and became known as a protégé of former Secretary of State Henry Kissinger. With that combination of experience, he is now looking into the future with The Seventh Sense, the title of his latest book. He speaks Mandarin, lives in both Beijing and New York and has spent more than a decade as an on-scene observer of China’s rise as a superpower. Ramo, raised in New Mexico, holds degrees from the University of Chicago and NYU. He has been a Crown Fellow of the Aspen Institute and was a founder of the US-China Young Leaders Forum. He was the China analyst for NBC during the 2008 Olympic Games and has appeared on such programs as Meet the Press, Fareed Zakaria GPS and Charlie Rose. The World Affairs Council is pleased to offer Dallas Busines Club members special pricing of $30. Select Cooperating organization when completing your purchase.